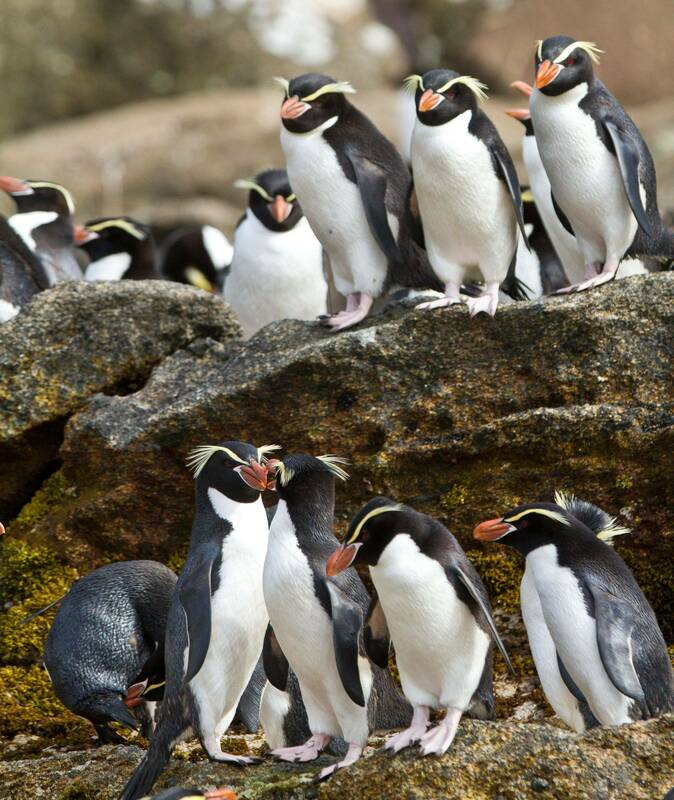 A 16-day holiday incorporating an 11-night cruise around the remote Sub-Antarctic Islands of New Zealand and Australia, home to the greatest concentrations of seabirds in the world! The remote Sub-Antarctic Islands of New Zealand and Australia are visited by only a handful of visitors each year. This tour, which includes an 11-night cruise aboard the ‘Spirit of Enderby’, takes you to the nutrient-rich waters of the Sothern Ocean where millions of albatrosses, penguins, cormorants and petrels arrive each year to breed. We begin the holiday in Invercargill, New Zealand’s southernmost city, and our first port of call is Snares Island where 60 million ‘tubenoses’ breed, as well as a bewildering number of other birds. Next we head to the Auckland Islands, the breeding ground of Yellow-eyed Penguin and Auckland Island Shag. As we continue our voyage, cruising from one archipelago to another, we’ll be followed by numerous seabirds as we travel towards Campbell Island, which will provide a fitting finale to our trip. All included in the price except for main meals in Invercargill and Bluff. This expedition voyage will be aboard the 'Spirit of Enderby', a comfortable 50-berth expedition vessel (see trip itinerary for more details ). A variety of cabin grades are available from cabins with shared toilet and shower, to cabins with private facilities, plus a very comfortable suite. Please refer to the Trip Itinerary for a full price list. In Invercargill we use a comfortable tourist hotel with private facilities. Whilst Antarctica is annually swamped by over 25,000 tourists, the remote Sub-Antarctic Islands of New Zealand and Australia are enjoyed by just a handful of visitors each year. This is surprising, as the islands, and their unusually nutrient-rich waters, provide nesting and feeding grounds for the world’s largest concentration of birds. The sheer abundance and diversity of wildlife in the Southern Ocean never ceases to amaze those few fortunate enough to visit. There are greater numbers and more species of seabird here than in any other comparable area on Earth. Literally millions of albatrosses, penguins, cormorants and petrels return to these windswept, isolated outposts each southern summer to breed, converging to create one of the world’s most magnificent wildlife spectacles. The numbers are mindboggling! Amongst Macquarie Island’s four million penguins, an estimated 850,000 breeding pairs of Royal Penguin and 218,000 pairs of King Penguin may be seen, together with a further 19 species of breeding seabird and 150,000 Southern Elephant Seals. Scattered across Campbell Island’s hillsides are some 7,500 pairs of Southern Royal Albatross, whilst on Snares Island, a rocky outpost covering no more than 243 hectares, it has been estimated that 60 million ‘tubenoses’ (petrels, shearwaters and albatrosses) breed, which alone — and not counting the penguins, cormorants and other nesting birds — exceeds the total number of seabirds nesting around the entire British coastline! There are few places remaining on our planet that have so successfully escaped the destructive forces of the human species. Such an opportunity for wildlifeviewing and photography is simply unparalleled in expedition cruising. Indeed, the islands’ appeal was summed up by Conon Fraser in his book ‘Beyond the Roaring Forties’ thus: ‘protected by the Southern Ocean, diverse, wonderful and lonely, they can be numbered among the last few unspoilt environments on Earth’. 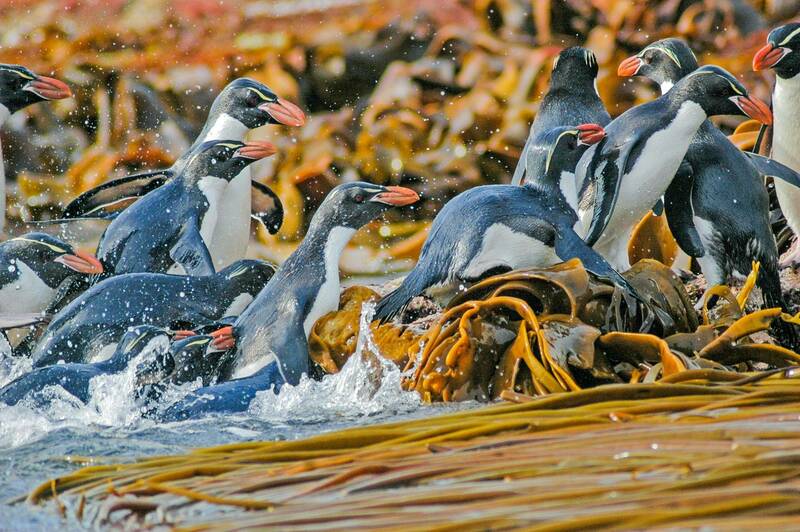 A visit to the Sub-Antarctic Islands is an adventure never to be forgotten. This 16-day holiday, incorporating an 11-night cruise, promises to be one of our most exciting wildlife expeditions of 2015. Our home will be the ‘Spirit of Enderby’, a comfortable, 50-berth ship which has been cruising the Sub-Antarctic Islands for over 20 years. Our expedition leader has unrivalled experience in these waters and with a full complement of Zodiacs, we will be able to make landings and enjoy wildlifeviewing in the most inaccessible of areas. Our holiday begins with a flight to Invercargill, New Zealand’s southernmost city, where we board the ‘Spirit of Enderby’ and head south to Snares Island, the first Sub-Antarctic island on our cruise and a nature reserve of international importance. The total number of birds that breed here defies belief. In addition to the aforementioned 60 million ‘tubenoses’ (including six million pairs of Sooty Shearwater), Snares is home to 30,000 pairs of the endemic Snares Island Penguin, plus Salvin’s Albatross, Southern Giant Petrel, Broad-billed Prion and Antarctic Tern. Snares Fernbird and Tomtit also occur around the edge of the island and are usually seen on Zodiac cruises around the rocky headlands and sheltered bays (landings not being permitted here). We next stop in the Auckland Islands, the breeding grounds of Yellow-eyed Penguin, Auckland Island Shag and the rare and endemic Flightless Teal. Gibson’s Wandering Albatrosses breed on the islands’ windswept grassy slopes and we hope to visit a colony of Shy Albatrosses on the main island’s south-western cape. Further south, we explore Macquarie Island, home to one of the greatest concentrations of wildlife in the southern hemisphere and an undoubted highlight of a highlight-packed cruise. This is the only nesting site of the Royal Penguin, 850,00 pairs of which nest alongside three other penguin species (King, Gentoo and Rockhopper) and numerous other birds. As we cruise from one archipelago to the next we will be followed by numerous seabirds. Magnificent Wandering Albatrosses sail by on the longest wings in the avian world alongside their small cousins such as Shy, Buller’s and Black-browed Albatrosses. Smaller still, an unrivalled variety of petrels, prions and shearwaters will test our identification skills to the limit whilst, beneath the waves, cetaceans such as Orca, Sperm Whale and Hourglass and Dusky Dolphins may be seen. Macquarie is the most southerly of the islands we visit, and from here we turn north-east to Campbell Island, the final island on our voyage. Here we will be greeted by 7,500 pairs of Southern Royal Albatross, plus the beautiful Light-mantled Sooty Albatross, Campbell Island Shag and, for the botanists amongst us, a selection of early flowering megaherbs. Campbell Island will make a fitting finale to our voyage, from where we complete our cruise back to South Island’s Port of Bluff and start our long journey home.